The Transport Accident Commission has suspended its funding to Victoria Police following revelations officers falsified more than a quarter of a million roadside breath tests. The Age revealed that more than 258,000 alcohol breath tests were faked over 5½ years, in what appears to be a rather deliberate ruse to dupe the system. In the wake of the scandal, $4 million in annual funding the TAC gives to police for road safety measures has been put on hold, the head of Victoria Police’s Professional Standards Command, Assistant Commissioner Russell Barrett, confirmed. “The TAC have suspended funding of our operations at this point, and we’re currently working through that with them to give them some reassurances,” Mr Barrett said. Meanwhile, an external investigator has been appointed to probe the breath-testing scandal. Former Victoria Police chief commissioner Neil Comrie will look into how the behaviour was condoned & allowed to occur and what the force could do to improve operational practice in the future. “I had not heard of our members engaging in such practiceSs. We let ourselves down, we’ve let the community down. It stops now,” Mr Barrett told The Age on Wednesday night. An audit found that in many situations, officers had blown into breath test units themselves or actually tampered with the test devices. The police findings represent about 1.5 per cent of the 17.7 million breath tests conducted. Police said about 1500 preliminary breath test devices were analysed during the internal investigation. Police Association secretary Wayne Gatt said the faked tests were the result of “critically under-resourced”, over-worked officers trying to meet unrealistic targets. “Call them whatever you want, targets, quotas, objectives. It’s no lie, every individual van across the state gets told that they have to target PBTs … it is wrong to say it doesn’t happen. It does happen. It happens every shift,” he told radio station 3AW. He said he did not believe the members who faked the tests should be stood down. “I dont think it’s criminal. It’s not fraud… no one is paid for the amount of tests they do. None of our members have a direct financial or other benefits from any of this. “This conduct is extremely disappointing and unacceptable — it’s wrong, it’s a breach of trust, and it won’t be tolerated,” Ms Neville said. While Ms Neville welcomed an independent investigation into the officers’ behaviour, she said there was no evidence to suggest their alleged conduct had affected drink-driving prosecutions. But opposition police spokesman Edward O’Donohue said the breach raised plenty of questions. “The integrity, not only of our police but our road safety regime, is paramount and it is up to Daniel Andrews to make sure this is thoroughly investigated,” Mr O’Donohue said. The Transport Accident Commission raised concerns with Victoria Police after they found an anomaly in data late last year, Mr Barrett said. It sparked the audit of the past 5½ years of data from the breathalyser devices. Usually there should be a space of time between each test, to take into account an officer talking to a driver and breathalysing them, before moving on to the next car, he said. But the faked tests occurred one after the other. Mr Barrett said he believed officers were faking the tests to make themselves appear busier. “The question we all asked was, ‘Why?’ There could be a number of reasons but the main rationale I believe is to hide or highlight productivity,” he said. It is believed self-testing was largely undertaken by police on general duties or highway patrol members, with some rural areas overrepresented in the available data. The practice was not common at supervised drug and alcohol bus testing sites, police stated. This entry was posted in Australia, BREATHALIZERS, FALSE LIES DECEIPT SCAMS, POLICE EQUIPMENT, POLICE METHODS, STORIES & NEWS and tagged alcohol breath testing by police in victoria australia, breath test falsehoods, false alcohol breath testing info, police breath testers under fire, victoria police & gbreath testing methods on May 31, 2018 by Henry. This entry was posted in CITIZENS VIDEOS, COURTS & JUDGES, POLICE CRIMES, POLICE METHODS, RACISIM, USA, VIDEOS MOVIES DVD'S AUDIO, WOMEN and tagged black female judge rages at police officer violence, judge & police scourn, police racisim & the judge condemnation, racisim in the courtroom on January 18, 2018 by Henry. [UPDATE 5.3.16: You cannot see the HILARIOUS annotations on mobile – so watch on desktop, for all the details & funny pop-ups. YES, the case was dropped once this video was shown to the Asst. D.A., There were NEVER any drugs to begin with & if they’re were I’m sure the K9’s nose would’ve been ALOT better than these 2 dirty cop’s noses. Also, I was instructed by my Atty. that with the Judges & Cops in that town; a Civil suit would’ve been a waste of time. I support cops as we need them/but loathe biased thugs hiding behind badges.] POLICE ARE SUPPOSED TO PROTECT & SERVE – NOT – PLANT EVIDENCE & POLICE PROFILE. This is personal to me/I’ll tell you why. In June I was illegally stopped while bird dogging RE properties with a white female Co-worker (Driver & owner) in a VERY rural part of VA. We were followed by an unmarked car so we voluntarily pulled over to allow him to pass. We were detained, searched for weapons & drugs and when that turned up nothing & instead of being allowed to drive away – 4 cruisers pulled up with a the K-9 dog and they proceeded to walk the dog inside & out. RESULT- That turned up nothing. So 2 cops ripped the car apart, looking for God knows what on the side of a country road for 1.5hrs and 5 other cops on standby in tactical gear. Picture 1 cop working the driver’s side & the other on the passenger side. After ripping through the car, the passenger side cop (Jr. officer) walks away and leaves his superior to finish. After finding NOTHING; the superior officer walks back to his squad car, the Jr. officer steps over to him, mumbles under his breath & the Superior officer bolts to the passenger side floorboard (my seat) and miraculously finds a morsel of marijuana. Something the dog & the other cop didn’t detect. He puts it in a tester, claims it to be Marijuana and that b/c it was found on MY side of the car—says ‘he’s giving me a citation for possession’. Why not arrest me –BECAUSE apparently the quantity was so small. WEIRD – So ask yourself, how is it a passenger with No marijuana (furthermore – 2 Non users), get pulled over for tinted windows (ONLY after I questioned the stop, the officer replied, give me your I.D. –UNFORTUNATELY for them I had NO warrants etc. ), has a K-9 dog & 2 cops search the car with NO results UNTIL 1 officer does something blatantly illegal WEIRDER – So ask yourself, how is it the officer on the driver’s side of the car, magically finds marijuana a dog couldn’t discover? WEIRDEST – After paying $1500 to a lawyer, the VA Prosecutor dropped the charges knowing there was a video. BUT NOW, I’M SADDLED WITH EXPUNGING THIS RIDICULOUS CHARGE FROM MY RECORD—ANOTHER FEE, and get this – Since Virginia is a Commonwealth, they reserve the right to DENY my request! Ps: So I guess June 25th was my day to get a drug arrest record, BY ANY MEANS NECESSARY! Pss: The Jr. cop (whom I believe planted the so-called Marijuana) even asked to see the vid –I suppose he wanted to see IF he was caught on tape & YES, it’s all on video. HAHA, these guys really think they’re cowboys. PIECE de RESISITANCE – I RECORDED IT ON HD Iphone VIDEO – So after some serious thought, I decided to post the video of (2) Virginia cops planting evidence and make them celebrities. This entry was posted in CITIZENS VIDEOS, DRUGS, FRAMEUPS, POLICE METHODS, RIGHT TO SEARCH, ROADSIDE POLICE, SEARCH WARRANTS, USA, VIDEOS MOVIES DVD'S AUDIO, WRONGFUL ARREST, YOUTUBE and tagged courts & virginia police, drug plantings by police virginia, innocent people harrassed by drug planting police in virginia, usa police at work virginia, virginia police guilty of drug planting in car on January 18, 2018 by Henry. Law Professor James Duane gives viewers startling reasons why they should always exercise their 5th Amendment rights when questioned by government officials. This entry was posted in CITIZENS VIDEOS, COURTS & JUDGES, DOCUMENTARIES, PEOPLE, POLICE METHODS, VIDEOS MOVIES DVD'S AUDIO and tagged crime & police talk, doco on police & law, pleasedo not talk to the police, presentation video by Law Professor James Duane, video explaining why you should never talk to the police, video law police & Law Professor James Duane, who is Law Professor James Duane on January 18, 2018 by Henry. Since the introduction of the random breath test, a police officer can pull you over anytime they’ like. There was once a time when, in order to be stopped by police, there needed to be a reason – or, to use legal parlance, you’d need to have given them probable cause (be it speeding, driving erratically or doing something illegal) – for a police officer to stop you. So, if you were to scream past a police car with a radar gun, cross double white lines or were spotted not wearing a seatbelt, using a phone or looking generally suspicious, you could be stopped. What are my rights if I’m stopped? What are you rights when pulled over by police? Since the introduction of the random breath test, a police officer can pull you over anytime they like. What do police check when I’m pulled over? Once stopped, police only need to ‘reasonably suspect’ illegal activity to search your vehicle. And the term ‘reasonable’ is incredibly vague, from the driver talking quickly or even just appearing nervous, which is just about every person ever stopped by the police. As mentioned above, the police can pull you over at absolutely at any moment – and without you having done anything to warrant the attention – to administer a random breath test. If a driver fails that ‘screening’ test, the traditional breathalyser is produced to take an official roadside reading. But if you fail, even that test won’t be produced in court, instead you’ll be arrested and taken to the closest police station (or to the command bus) where you’ll be tested a third time, the results of which will be used as evidence. Refuse a breath test at the side of the road, and you’ll be immediately taken to the station for an official test. Refuse that, and you’ll be charged and face heavy penalties – often worse than those for high-range drink driving. What are my rights when I’m pulled over for speeding? And its here where you should be particularly cautious with what bonus information you offer the police. If you’re sprung by a fixed camera or radar gun, your chances of defending it in court are minimal. But in NSW, for example, police can still book you on what’s called a speed ‘estimate.’ That means the police just have to think you were speeding, and don’t need to provide any proof. This entry was posted in Australia, POLICE METHODS, RIGHT TO SEARCH, YOUR RIGHTS and tagged AUSTRALIAN POLICE SEARCHES, police & your rights in australia, your rights & australian police, your rights & police on March 22, 2017 by Henry. Most daring, dangerous, wildest, and shocking videos of police and criminal shootouts ever caught on tape. DENVER — Raw video from the Denver officer-involved shooting. In the video, an unidentified man takes a woman and uses her as a shield while police yell for the man to surrender. (DenverChannel) DENVER – Denver Police have identified the suspect who allegedly took hostages inside a 7-Eleven Monday. Police said 34-year-old Blas Leroux was shot in the shoulder as he tried to use one of the hostages as a human shield. The standoff began at 8:30 a.m., after witnesses saw the suspect running from police. Police Chief Robert White said negotiators tried for nearly an hour to get him to surrender. He refused and instead used one of the three hostages as a shield in an attempt to escape. Leroux was taken to a nearby hospital with a gunshot wound to the shoulder. The hostage was not injured. A Colorado Bureau of Investigation report shows Leroux has used several other names. He has a lengthy criminal record including convictions for trespass, motor vehicle theft, assault, burglary, child abuse, escape and harassment. Police chase a stolen van in South Los Angeles, California. The suspect crashes into a multiple cars during the dangerous pursuit including a LAPD patrol car. The suspect jumps out and runs after spike strips disable the white cargo van. Police in a Phoenix suburb fatally shot a machete-wielding man Thursday after he rammed a patrol car in a stolen truck, injuring an officer. Avondale police said the man was shot after he refused to drop the machete and a pocket knife. Authorities identified the man as Jeremy Bustos, 43, and said he was rushed to a hospital along with an Avondale police officer who was injured in the collision. The officer’s name hasn’t been released, but Avondale police Sgt. Brandon Busse said the officer was in stable condition and improving at a hospital with non-life threatening injuries. Witnesses said the suspect was shot at least twice and helicopter news video showed him falling to the ground before he was taken to a trauma center. Busse said the spree started when a man assaulted a city maintenance worker on the side of a roadway and stole his city truck about 9 a.m. The man took the truck on a joyride as police pursued before officers got a helicopter to track the stolen vehicle and backed off, authorities said. Police began a pursuit and used tire-puncturing devices and the chase ended with the truck ramming the police car. Officers confronted the suspect, who refused their commands and advanced toward them with a machete and pocket knife and was shot, according to Busse. Avondale Fire Department crews extricated the police officer from his vehicle and he was airlifted to a Phoenix hospital. A DUI suspect leads CHP officers on a chase on the Pacific Coast Highway on April 16, 2013, before resisting arrest. As the chase ends on the PCH, the suspect gets out of his vehicle, dances and then walks right up to armed officers, forcing police to take action in a nail-biting scene that ends in his arrest. Compilation : video BEST OF the best Police and epic FAIL / crash. Moto Chases – Cops VS Racers Best Compilation! This entry was posted in CAR CHASES, CITIZENS VIDEOS, DOCUMENTARIES, LISTS, POLICE METHODS, Police Videos, SHOOTINGS, USA and tagged car chase police videos, car chase videos on line, police car chases videos on line, police shootout videos, you tube police shootout videos on October 21, 2015 by Henry. A YouTube video shows Delaware police officers shooting a man in a wheelchair on Friday. Warning: graphic content. Wilmington: The police shooting of a man in a wheelchair in Wilmington, in the US state of Delaware, was “unjust”, his mother said, but authorities described a different scenario, saying the man was pulling a handgun from his waist when officers shot him to death. The shooting happened on a narrow street in Wilmington on Wednesday around 3pm. Officers responded to a 911 call of a man who had shot himself, and when they arrived, 28-year-old Jeremy McDole was “still armed with a handgun”, Police Chief Bobby Cummings said during a news conference. McDole’s mother, Phyllis McDole, interrupted the briefing. “He was in a wheelchair, paralysed from the waist down. There’s video showing that he didn’t pull a weapon … I need answers,” she said. Police shot dead a wheel-chair bound man – Jeremy McDole – in Wilmington, Delaware, on Wednesday, September 23. Screen Shot 2015-09-25 at 1.33.23 PM.png Photo: Image from YouTube video. Mr Cummings said officers approached McDole and told him to put the weapon down. As McDole was removing the gun from his waist, officers “engaged him”. “I assure you that not one of those officers intended to take anyone’s life that day,” Mr Cummings said. Video of the shooting posted online, which the chief said appeared to be authentic, shows an officer approaching McDole with a gun drawn, shouting “show me your hands” and “drop the gun”. Other officers then appear in the video with their guns drawn, yelling similar commands. Police shot dead a wheel-chair bound man – Jeremy McDole – in Wilmington, Delaware, on Wednesday, September 23. Screen Shot 2015-09-25 at 1.33.40 PM.png Photo: Image from YouTube video. In the video, McDole moves around in his wheelchair and reaches into his jeans, but it’s unclear what he is doing. The officers, who are not in the video at this point, fire multiple shots and McDole falls out of his wheelchair. Mr Cummings said he was not aware of any attempt by officers to use non-lethal force before shooting McDole. He also would not say whether he thought the situation should have been handled differently. “Only our thorough investigation will reveal that,” he said. The shooting is being investigated by the department’s criminal investigation and professional standards units, as well as the Delaware Department of Justice’s Office of Civil Rights and Public Trust, which will determine whether any officers will be charged. The state agency investigates all police shootings that result in injury or death. Jeremy McDole in his wheelchair in Wilmington, Delaware, before he was shot on Wednesday, September 23. Screen Shot 2015-09-25 at 1.33.57 PM.png Photo: Image from YouTube video. Richard Smith, head of the Delaware chapter of the NAACP, called for a special prosecutor to investigate the shooting, and “to not have cops investigating cops”. McDole’s uncle, Eugene Smith, was among a crowd of a couple dozen people who gathered on Thursday at the scene of the shooting. Mr Smith said he was with his nephew about 15 minutes before the shooting and he didn’t see a gun. McDole was black. The race of the four officers who fired was not released. All four are on administrative duty. One of the officers has been on the force for 15 or more years, and the others had been there for about five years, the police chief said. Late on Thursday, about 100 people gathered outside of Phyllis McDole’s home for a candlelight vigil and expressed their frustrations about the shooting. A .40-calibre shell casing was found in the grass about 15 feet from where McDole was shot. Police said a .38-calibre gun was found by McDole’s side after he was shot. Mr Smith said McDole had gotten out of jail about a year ago and was living in a nursing home. McDole has an arrest record that dates back to 2005 and includes convictions for drug possession and disorderly conduct. He was also arrested for carrying a concealed deadly weapon and resisting arrest, but those charges were dropped. In November, McDole was found to have violated his probation. McDole was paralysed when he was shot in the back in 2005 by a friend he had been walking around a neighbourhood with, smoking marijuana, according to court documents. McDole initially told police that his friend Randal Matoo shot him, but later testified that he didn’t know who shot him. Matoo was convicted of first-degree assault and possession of a firearm during a felony. This entry was posted in CITIZENS VIDEOS, POLICE METHODS, SHOOTINGS, USA, VIDEOS MOVIES DVD'S AUDIO and tagged delaware police shooting, man in wheelchair shot by police, wheelchair victim shot by police\police excecute wheelchair black man on September 25, 2015 by Henry. NSW is over-policed. Taxpayers are funding a costly, inefficient and increasingly intrusive force that devotes only 21 per cent of its work hours to investigating crime. Most of the rest is soft stuff and bureaucracy. The amount of the public’s time being wasted by police is both prodigious and unacknowledged. Without exception, every single intrusion by police, every act of harassment, every misallocation of resources, is rationalised as “public safety”. This Orwellian catch-all is used to rationalise a multitude of sins. 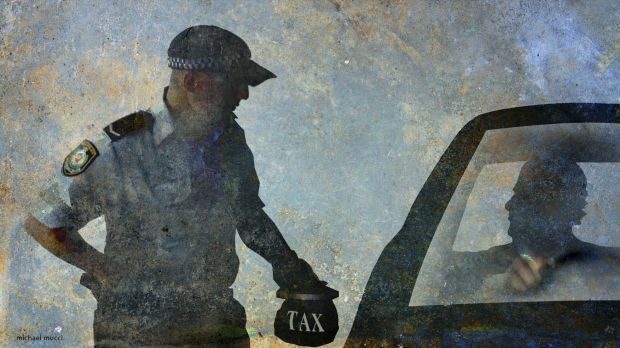 On average, about 16,000 people a day are enduring random intrusions by police, fined for petty offences, or fined via private tax collectors acting for profit. On December 22, a woman double-parked outside my house to pick up a package from me. It didn’t take long, it was mid-afternoon, the street was quiet. Suddenly, a police siren wailed. A patrol car had pulled up behind her. The siren blast was manifestly unnecessary. The woman drove off and there had been no disruption to traffic. A few days later she received a Traffic Infringement Notification. She had been fined $242. She could pay or she could go to court. She was outraged. By any measure, this was bastardry, and thus poor policing. Patrol cars are linked to the police data base, so Officer Siren would have seen that the woman had a very good driving record. He booked her anyway, for a trivial breach. Two weeks ago it happened again. Another police siren outside my house. It was mid-morning. I went outside to see another woman being booked by another Officer Siren. Every year, NSW police stop more than five million people who have done nothing wrong. They do so politely, but most of these interventions are non-productive and cost the public tens of thousands of hours of lost time. The majority of these checks are bureaucratic make-work. Only about 0.35 per cent of people stopped for random breath tests are charged with an offence, and most of those offences are minor. That’s a 50 per cent surge. The NRMA urged the government to have the speed limit displayed on warning signs, “to reduce unnecessary anxiety for motorists”. It called for a fairer, safer warning system, as warnings are currently displayed only 250 metres and 50 metres before the speed camera. The NRMA wants the speed camera vehicles more clearly marked. Redflex thus estimates it will harvest revenue of $23 million during the duration of its contract until 2016. Packaged as “public safety” of course. Ever since random breath testing was introduced in 1982, there has been a steady decline in road fatalities. The annual reports of the NSW Police have cited RBT as the most effective tool in the fight to reduce fatalities. But the deterrent effect of RBT plateaued years ago. The continued downward trend in fatalities in the past decade has come more from the introduction of air bags and improvements in auto technology. Police could achieve broadly the same impact with RBT with half the rate of stoppages, half the cost, and half the social disruption. Instead, the police and the government are going in the opposite direction, with more intrusions. Compounding this policy malfunction is the rip-off of motorists at the federal level. Over the past 15 years, the federal government has extracted $136 billion in fuel excises from vehicle-owners, yet spent $53 billion on road infrastructure. The disparity is $83 billion. Vehicle owners are thus being milked by government in addition to the impositions imposed by the states. Then there is local government, where inner-city councils deploy swarms of tax collectors they call “rangers”. No bureaucratic euphemism can disguise the grim pettiness attached to the term “parking inspector”. They seem to live in my street. At every level of government – federal, state, local – vehicle-owners are being used as cash cows by government, in a disingenuous and increasingly intrusive way. And I don’t even own a car. This entry was posted in Australia, POLICE METHODS, REVENUE RAISING, TRAFFIC ISSUES on March 22, 2015 by Henry. This entry was posted in Australia, FINES, POLICE METHODS, REVENUE RAISING, SPEED, SPEED CAMERAS and tagged low level speeding & police in australia, low speed fines are a joke, minor speed infringements are a revenue raising method for deprived police service, quotas for police to raise money, sneaks & creeps in revenue raising methods, the revenue aspect of fining people for marginal speed infringements, why apply fines for marginal speed infringements on October 27, 2014 by Henry.